The London Knights, Guelph Storm, Saginaw Spirit and Sault Ste. Marie Greyhounds are the four teams left standing in the Western Conference. Here’s a closer look at a pair of highly anticipated Western Conference Semi-Final series. Midwest Division rivals clash in second round action as the first place London Knights battle a beefed up Guelph Storm club that is powered by a pair of Londoners in captain Isaac Ratcliffe (50-32–82) and midseason addition Nick Suzuki (34-60–94). The Knights are chasing their fourth OHL Championship in a span of eight years, still flying high after big performances from CHL Player of the Week Adam Boqvist (20-40–60) who has scored six times in the past two games. 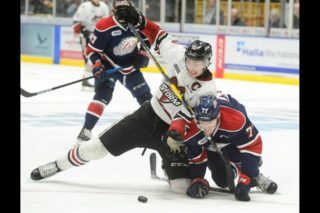 The Knights swept away the rival Windsor Spitfires as Ottawa Senators prospect Alex Formenton (2-9–11) finished the first round in the OHL playoff scoring lead followed closely by captain Evan Bouchard (2-8–10). London plays at high speed, featuring a pair of the league’s quickest forwards in Formenton and Columbus Blue Jackets first round pick Liam Foudy (36-32–68). They featured the league’s best penalty kill (85.8%) this past season, one that has remained efficient into the playoffs while the man advantage has gone 7-for-13 (53.8%). The Knights had their hands full with the Storm this season, a big-bodied team that plays physically and, like London, features a back end that can transition the puck quickly. Guelph skated to a four-game series sweep of the rival Kitchener Rangers as Arizona Coyotes prospect Nate Schnarr (2-8–10) led the way offensively followed by a five-goal performance from St. Louis Blues pick Alexey Toropchenko (5-2–7). 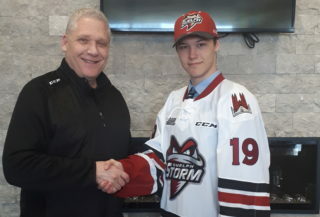 Storm head coach and general manager George Burnett made a big splash at the midway point of the season, bringing in Suzuki, defending OHL champion MacKenzie Entwistle (30-27–57) and a pair of veteran defenders in Markus Phillips (5-21–26) and Fedor Gordeev (7-25–32). The Storm will need some saves from 19-year-old Anthony Popovich in this series as he squares off opposite Vegas Golden Knights prospect Jordan Kooy who got the not over Joseph Raaymakers in London’s first round action. A pair of veteran teams with veteran head coaches lock horns in a high-powered Midwest melee. Don’t change the channel on this series. 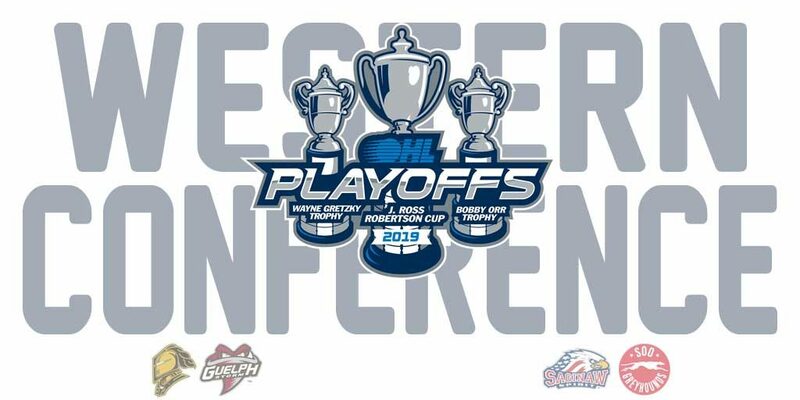 This marks the eighth time that London and Guelph have met in the OHL Playoffs. 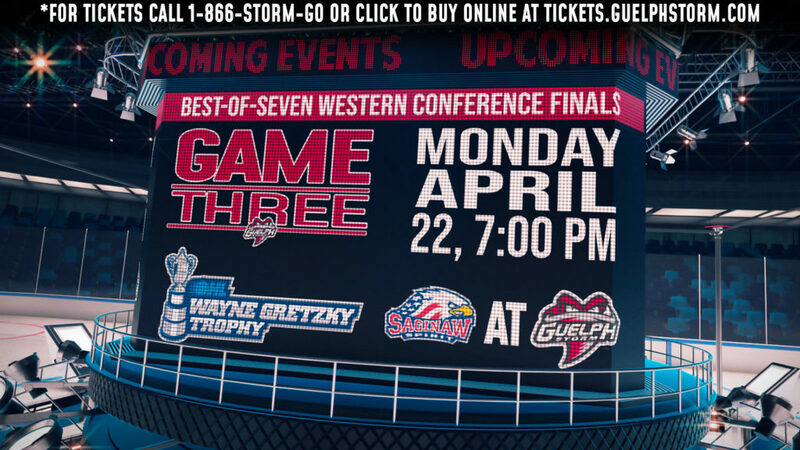 Game 1, Fri., April 5, Guelph at London 7:30 p.m.
Game 2, Sun., April 7, Guelph at London 2:00 p.m.
Game 3, Mon., April 8, London at Guelph 7:00 p.m.
Game 4, Wed., Apr 10, London at Guelph 7:00 p.m.
Two teams that went at it all season, the Saginaw Spirit and Sault Ste. Marie Greyhounds will get to settle their differences once and for all in a best-of-seven second round series. The Spirit edged out the Greyhounds on the final weekend of the regular season for their first West Division title since 2011, quite a turnaround for Saginaw after the way the season started. Head coach Chris Lazary took the reins on November 18th, guiding the club to a 34-8-2-2 record under his watch during the regular season. General manager Dave Drinkill made significant additions in Owen Tippett (33-41–74), Ryan McLeod (19-43–62) and Justin Murray (12-28–40) along the way while rookie phenom Cole Perfetti (37-37–74) exceeded everyone’s expectations. Saginaw swept the Sarnia Sting in first round action as Tippett led the way on the scoresheet with eight points (5-3–8) while goaltender Ivan Prosvetov continued his strong play with a .937 save percentage. The Greyhounds, who had won four of the past five West Division titles entering this season, look to fend off a new challenger in a Saginaw club they swept in the first round last spring. Sault Ste. Marie comes off a five-game first round series triumph over the Owen Sound Attack. Coached by first-year bench boss John Dean, the Hounds boast plenty of their own firepower. Back-to-back 100 point scorer Morgan Frost (37-72–109), 46-goal man Keeghan Howdeshell (46-31–77) and captain Barrett Hayton (26-40–66) headline a group that also features emerging Czech winger Jaromir Pytlik (11-8–19) and playoff assist machine Jaden Peca (0-8–8). Puck-moving blueliners Mac Hollowell (24-53–77) and Jordan Sambrook (17-32–49) give the Greyhounds a dynamic edge on the back end while Matthew Villalta continues to find ways to win in the Sault Ste. Marie crease, racking up 98 victories over the past three seasons. Seven of the eight meetings between the two clubs this season featured at least one of them scoring at least five goals. Expect this series to be no different as two high-flying West Division foes go shot-for-shot, with execution likely to be the deciding factor when all is said and done. This marks the fifth time that Saginaw and Sault Ste. Marie have met in the OHL Playoffs. 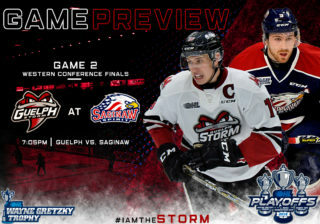 Game 1, Fri., April 5, Sault Ste. Marie at Saginaw 7:05 p.m.
Game 2, Sun., April 7, Sault Ste. Marie at Saginaw 5:30 p.m.
Game 3, Tues., April 9, Saginaw at Sault Ste. Marie 7:07 p.m.
Game 4, Thurs., April 11, Saginaw at Sault Ste. Marie 7:07 p.m.